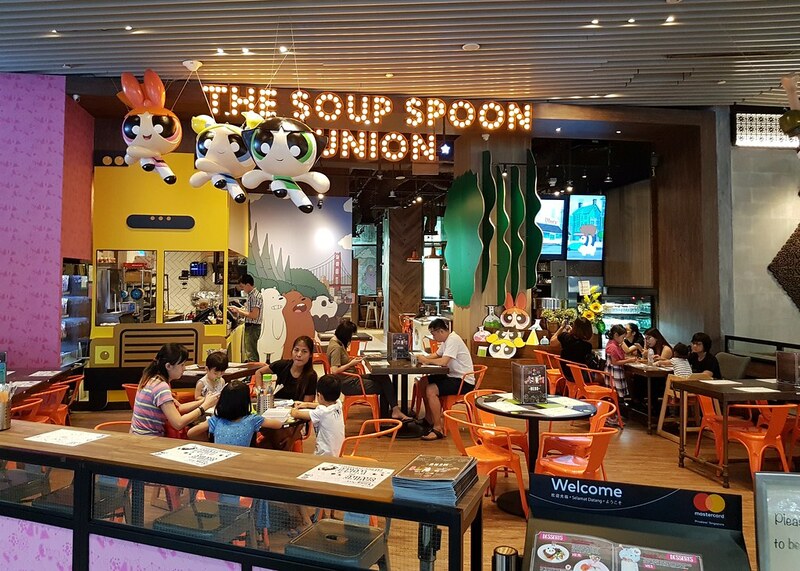 Following a collaboration between The Soup Spoon Union and Cartoon Network Asia-Pacific, a cartoon-themed cafe, Cartoon Network Cafe by The Soup Spoon Union opened its doors just last month at the Waterway Point Mall in Punggol. 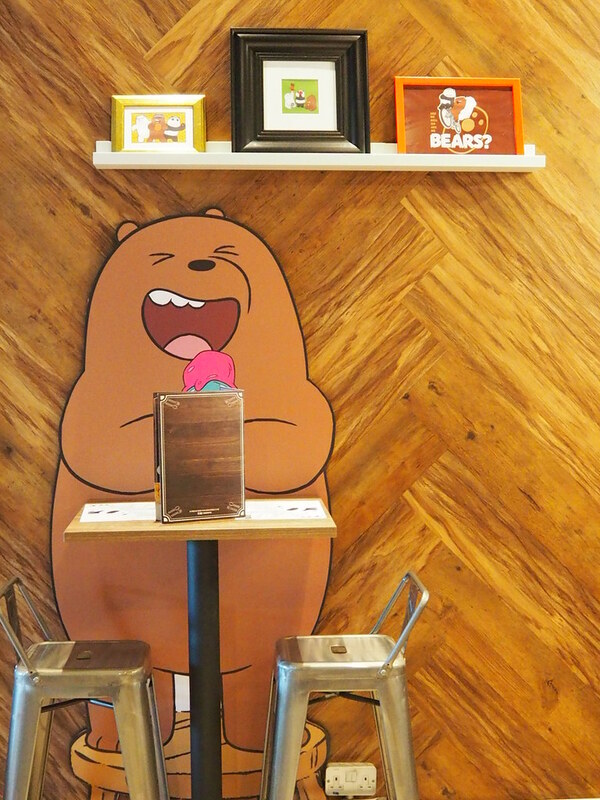 A setup thoughtfully decorated with statues, cutouts and toys of loved characters such as the Powerpuff Girls, We Bare Bears, Ben 10 and Adventure Time Land, it renders every spot in this fun-filled 93-seater café an IG-worthy haven that will have all the kids (and even adults) screaming internally in delight. Its appeal is further amplified with a wide variety of dish offerings inspired by the animated shows and its characters that will instantly transport you back to the good ol' days. We stepped in and dove right into their extensive menu featuring a slew of pretty themed dishes ranging from appetisers, mains, desserts, drinks and milkshakes. Big on visuals but how do they fare in taste? 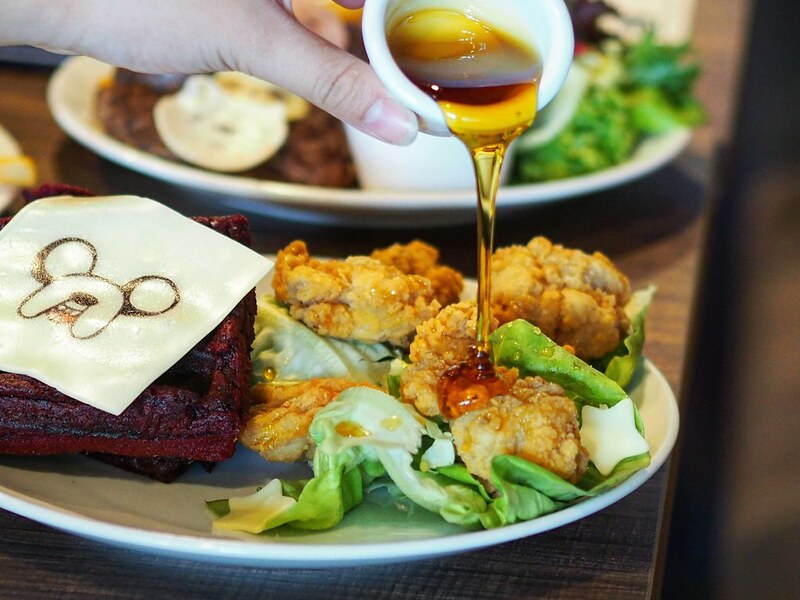 The Finn & Jake’s Chicken with Red Velvet Waffles ($15.90) features crispy pops of chicken karaage with red velvet waffles. A different take on the classic chicken waffles dish, the red velvet waffles is a sweeter rendition with a cakey brownie-like texture and a strong hint of cocoa flavour. The waffles may be a tad too dry but it is made better with a liberal drizzle of the accompanying honey served alongside, as well as the crispy and juicy chicken karrage pieces that were well-executed. A sweet and savoury marriage of flavours which surprisingly worked out for me. 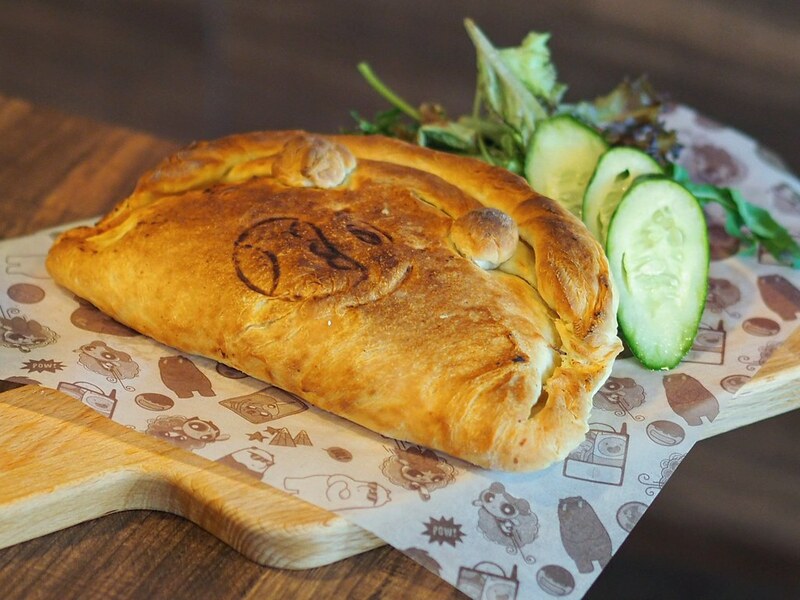 The Pan-Pan Calzone ($10.90) is essentially a folded in version of pizza in a huge pie-like shape. Biting into the crisp crusted exterior reveals savoury insides, with tomato sauce, cheese and meats. Decently executed, this dish is a hit among the kids. 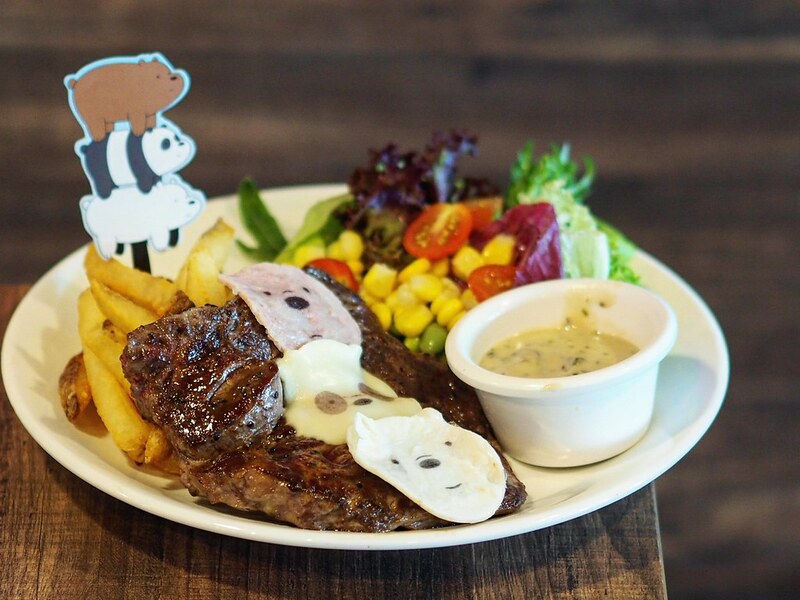 The We Bare Bears Angus Ribeye Steak ($23.80) comes with a beef ribeye steak and a side of fries and salad. Done medium rare, the steak is grilled to a slightly tougher texture and a tad dry lacking the succulence and seasonings for that burst of flavours. 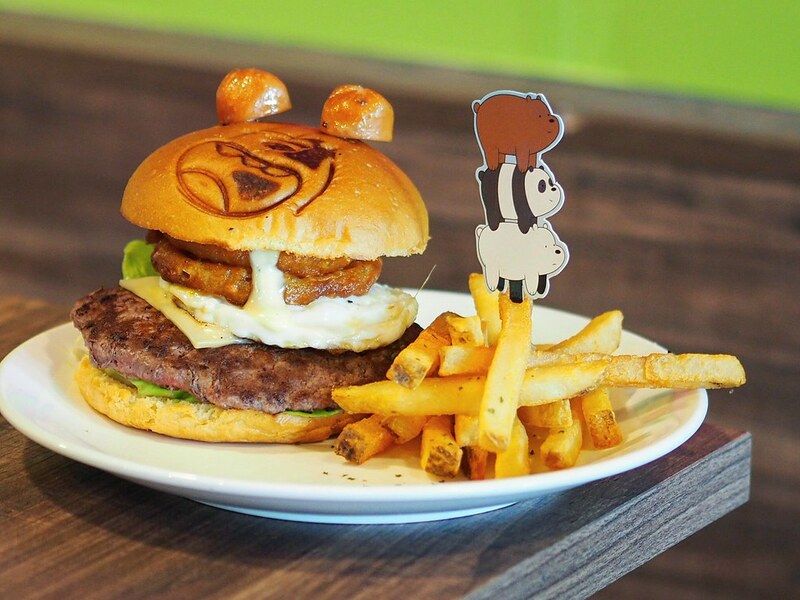 The Grizzly Beef Burger ($18.80) features generous ingredients including the beef patty, onion rings, sunny side up egg, mushrooms and cheese centred between soft brioche toasted buns that has We Bare Bear’s big brother Grizz’s face with two small sausages that made up its ears. The beef patty boasts a softer texture though the overall quality was below satisfactory due to the tasteless meat which lacked seasonings. The only flavours that came through were perhaps the cheese and thin pieces of onion rings sandwiched in between. 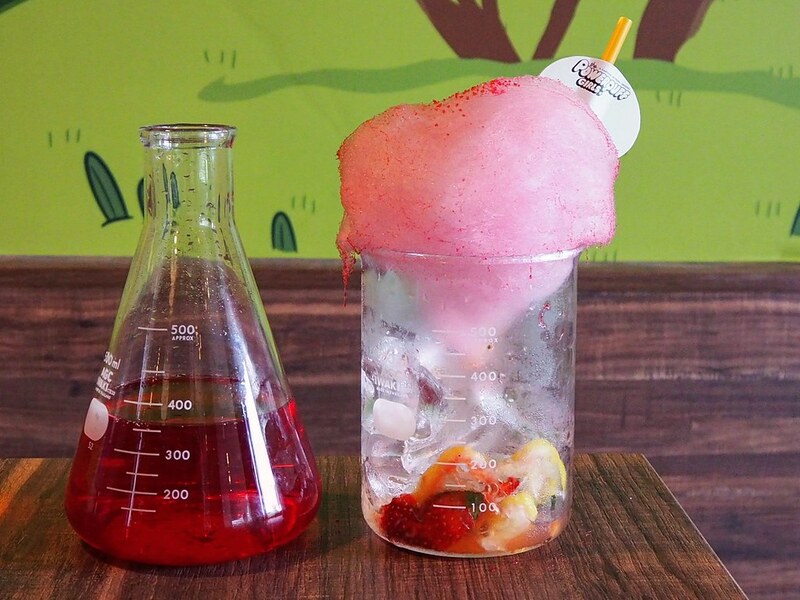 For the drinks, we had the Blossom Strawberry Soda ($10.90) which comes in a flask of strawberry flavoured soda and a fluffy cloud of cotton candy perched on top of a beaker of strawberry and lemon slices. Pouring the strawberry drink in melts the cotton candy in the process, which adds a sufficient sweetness to the strawberry soda, giving it a non-cloying and refreshing taste to the drink with a slight tangy tinge of lemon. From the desserts menu, we had the Bubbles Cheesecake ($14.90) which features a gorgeously plated dish of creamy cheesecake slice, sweet berries, whipped cream, biscuit crumbles and cotton candy on the side. The cheesecake boasts a soft texture with a rich cheese flavour to it, while the crumbles added a crunch to the soft cheesecake, as well as a mild saltiness to the sweetness of the cheesecake for a more balanced flavour of the dessert. 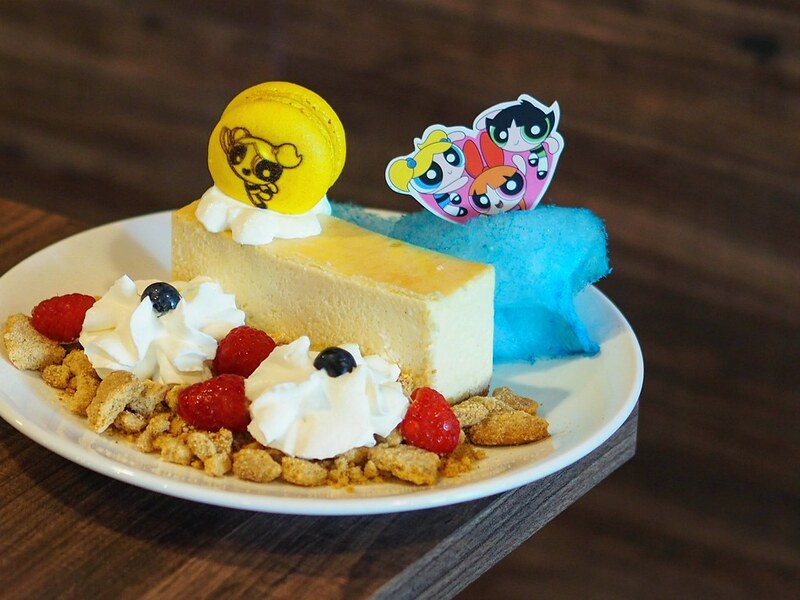 The Cartoon Network Café has done well with the decorations of the place and design of its themed dishes, yet there are still much room for improvement in terms of the food quality. Although it does curate a fun-filled and memorable dining experience for the kids, the prices may be a bit too steep as like the other character cafes in Singapore, which might make visits a one-time experience for most. However, as the characters featured will be rotated every 3 to 6 months, we wait in anticipation as it brings back opportunities to excite taste buds and have crowds of people showing up for another unique dining experience at CN Café again.